Through hard work and constant innovation, Viking Cold Solutions earned a spot on the coveted Food Logistics’ 2017 Top Green Providers list. As one of only 100 companies to have been chosen, this placement offers Viking Cold the chance to broaden their exposure while continuing to provide energy-saving solutions across the global cold chain. The company has stated that not only are they honored by the selection, but by the opportunity to make a significant impact in the industry’s endeavor to embrace sustainable practices. Food Logistics is the premier publication tracking how food is transported from farms all over the world to your dining table. Their 2017 list encompasses businesses in a wide range of specialties, from shipping companies to pallet manufacturers, and everything in between. Because the industry as a whole has increased its efforts to become more environmentally focused, more and more businesses look to the Top Green Providers when deciding to form new partnerships. Each year the criteria for selection becomes more stringent, making the nomination process quite competitive. But due to their outstanding environmental positioning, Viking Cold Solutions was quite simply a natural choice. As the only thermal energy storage company to be selected, Viking Cold’s technology is gaining quite a bit of market recognition, and for good reason. Unlike other thermal energy storage systems that only shift energy consumption to a lower cost period of the day, Viking Cold’s technology delivers a one-two punch of cost reduction and net consumption reduction. Their passive energy storage system is designed to work with existing refrigeration systems to provide thermal backup protection, and system monitoring that alerts businesses before a minor issue turns into a serious concern. Plus, their freezer installations have shown sustained net reductions of 20-35% kWh consumption. By storing thermal energy during the low-cost periods of the day to be used during the hours when it is needed most, the system has proven to save up to 90% of peak demand charges. it is this technology that earned Viking Cold their much sought-after spot on the 2017 Top Green Provider list. 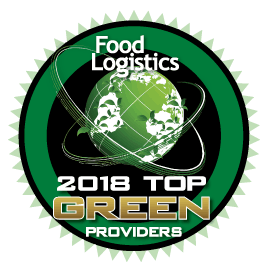 While it is both an honor and an exciting opportunity to be featured as one of Food Logistics’ Top Green Providers, the true motivation for Viking Cold comes from the success of their clients. Since their patented thermal energy storage systems hit the market, the company has saved their customers over 8900 MWh of energy while preventing millions of dollars of product loss. By providing such massive energy savings, they are helping customers grow their business via environmentally sustainable means. From cold chain systems in grocery stores to processing and distribution facilities with exact temperature needs, Viking Cold provides a reliable and technologically sound product that greatly reduces energy usage. Click here to learn more about how Viking Cold can improve the efficiency of your cold storage!